Before I get started – if you’re itchin’ to see the new release right away – click HERE! Okay…are you feeling calmer now that you’ve seen it all? *grin* Yes, I know you. Alrighty, let’s get on with my cards! 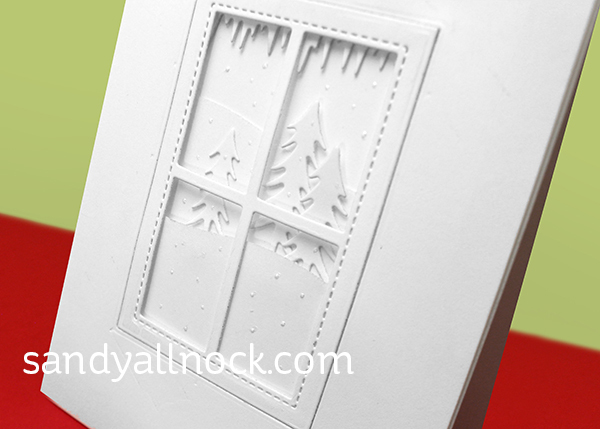 It’s new release day for Ellen Hutson – and I am stoked about this winter window die! 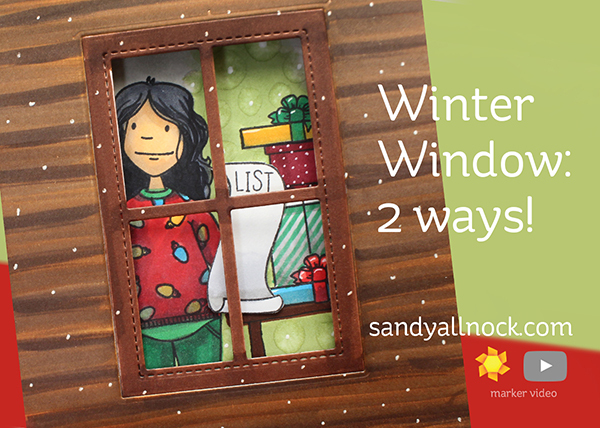 I’m pairing it with the Holiday Shopper Lady – but this window has SO many uses. Just see the plain white one and imagine it with spring colors or fall colors. (RIGHT?!) Watch the video below or click HERE to see it in HD on YouTube. Even if all you make is a pretty white on white card – this die is soooooo pretty! Here’s a closeup – I used Liquid Pearls to make the snow. A little piece of acetate would add some shine to this too! And my crazy coloring version. Because….well because I’m me, right? Did you expect less? This video wasn’t about the coloring, so I hope there’s grace for not including all the marker numbers! Great card. I may just need to send you a card this year since you will treasure it. Love these cards Sandy. The white on white one is just stunning. 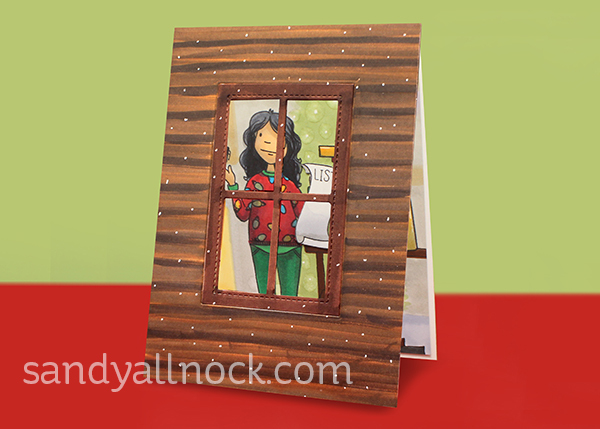 The holiday shopping lady is fantastic – love how you made her a whole background!! Cuteness!! Thanks for sharing the versatility of these products! Stunning Sandy, I love the white card but the card with the Lady is awesome. Great colouring as usual. Thank you so much for sharing and showing. These are completely fabulous. 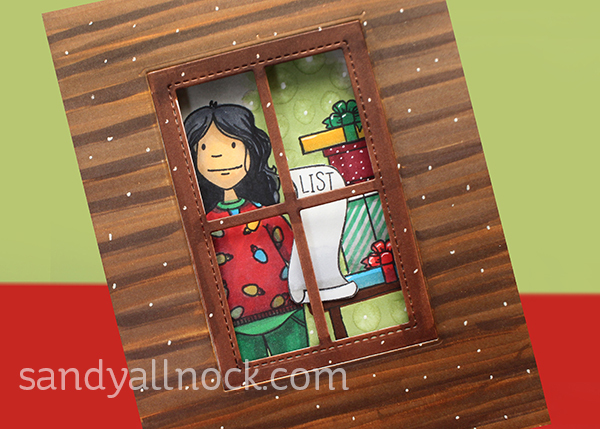 I LOVE LOVE LOVE window cards. Love your idea of the window opening to a scene. 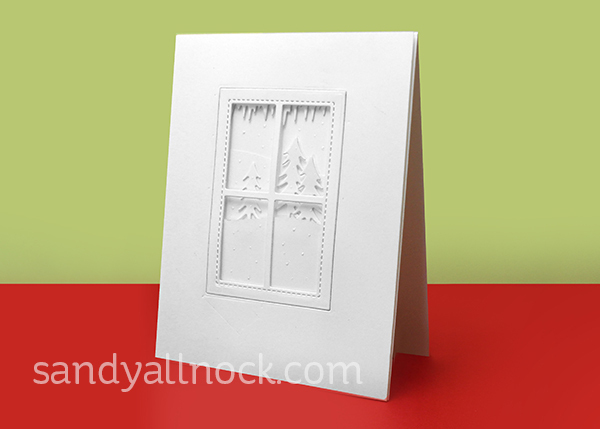 This would be fun to do with a cat or dog in the window – or even a Santa or elf. So many ways to make this fit the person receiving it. I can’t wait to see how you use this for different seasons but it got my imagination working. The window die seems a great stash builder. Sandy, I do love your work and I still have your tag you sent me. But why did they make that lady’s mouth so BIG? She looks like quite a frump with the mouth like that. Love what you do with her though. Love all your work.